99.00 AED AED tax excl. The slip ring can be used in any electro-mechanical system that requires unrestrained, continuous rotation while transmitting power and / or data from a stationary to a rotating structure. 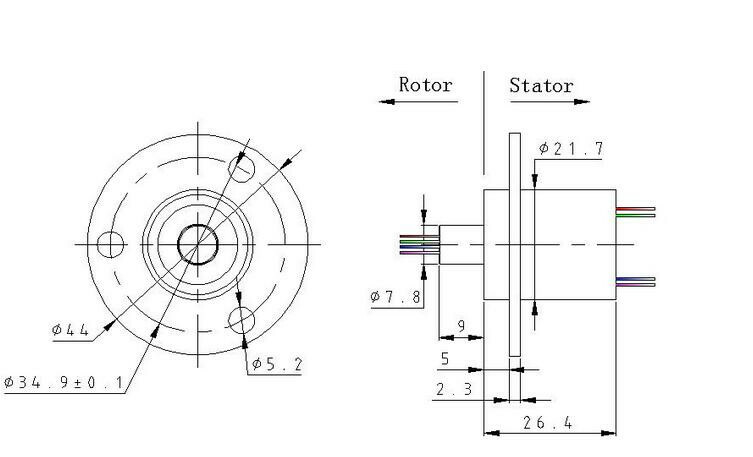 The slip ring is also called a rotary electrical interface, commutator, collector, swivel or an electrical rotary joint. The brush adopt noble metal alloy material, Conducting ring Using a 900 V-groove ring.It adopt multilayer noble metal alloy for plating dispose. The use of noble metals (gold to gold alloy) assures long lifetime with low resistance, low electrical noise and low interference between circuits. Color-coded lead wires are used on both the stator and rotor for simplified electrical connections. The very low electrical noise makes the SRC series suited to transmission of critical signals, such as high frequency signals (video, field buses) and weak signals (strain gages, thermocouples, measuring equipment). Versions with up to 6 A or 10 A circuits are available. Designed for a flexible, cost-effective and reliable solution, these units are available in many standard configurations using 6 to 12 circuits. The compact size allows installation into small systems with high performance requirements. The SRC series can also be customised on demand (connectors, cables length, special cables, number of circuits, etc. ).